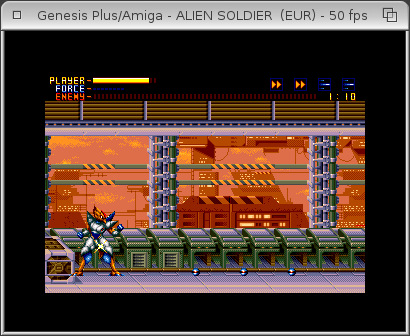 GenesisPlus - Sega Genesis/MegaDrive emulator on AmigaOS. GenesisPlus is very compatible and accurate Sega Genesis/MegaDrive emulator. Being Sega's best selling console of all time, the Genesis/MegaDrive received many games, which are very nice to play even today. More than twenty years after it's release the console is still popular, even cloned after its production stopped. One of these clones is the Extreme Land - a great addition to my hardware collection. Because of the strong following and fans around the world, the Sega Mega Drive games are enjoyed by many people, be it on another more powerful hardware via emulation, on original console or console replicas. 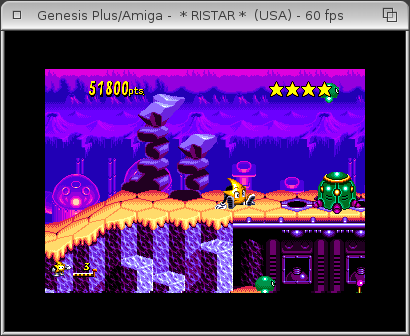 The GenesisPlus emulator opens the option to play all these 16 bit games, which were never released on the Amiga, but done on the Sega, or the Amiga games but on different hardware, which is a challenge for many amigans. Thanks to the emulator, the Sega consoles only games like the Ristar which is a classic, Sonic the Hedgehog and it's endless hours of fun speeding through the tungsten carbide rings and collecting emeralds and other jewelry, and of course Streets of Rage, where you fought through what felt like endless waves of New York's worst thugs and rebellious criminals. The emulator features fullscreen support, Amiga Joystick recognition, automatic recognition of cartridge type, automatic decompression of zip compressed cartridges, turbo mode and save states support. It is permanently under development and recently received many updates, improving the emulation engine, making it faster and more compatible with the original Mega Drive hardware. This Amiga version is based on the Nintendo Gamecube / Wii port, which got several strong updates during the last years. For a start the Cat At Crossroad game for Sega Mega Drive, written by me, can be downloaded from the Sega section. The game was easily converted from the Amiga and can be used for testing. GenesisPlus, together with the DGen Sega Mega Drive emulator, make many classic game titles available for the Amiga users around the world.